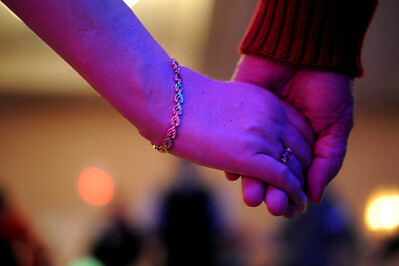 Sarah Nader - snader@shawmedia.com Two people hold hands during the First Dance event hosted by Gulbrandson Orthotics & Prosthetics at the Holiday Inn in Crystal Lake on February 12, 2012. People with physical challenges were taught how to dance by instructors at the Center for Ballroom and Dance in Deer Park. Sarah Nader - snader@shawmedia.com Carter Lamb (center) and his wife Barb Lamb of Cary dance a waltz during a First Dance event hosted by Gulbrandson Orthotics & Prosthetics at the Holiday Inn in Crystal Lake on February 12, 2012. People with physical challenges were taught how to dance by instructors at the Center for Ballroom and Dance in Deer Park. Sarah Nader - snader@shawmedia.com Dance instructors Alisa Alyabyeva (right) and Cinnamon Trammell show the crowd how to waltz during Sunday's First Dance event hosted by Gulbrandson Orthotics & Prosthetics at the Holiday Inn in Crystal Lake on February 12, 2012. People with physical challenges were taught how to dance by instructors at the Center for Ballroom and Dance in Deer Park. 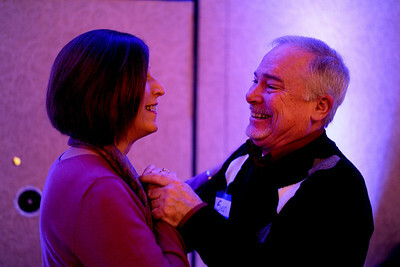 Sarah Nader - snader@shawmedia.com Nancy Meehan (left) of Barrington and her husband, Sean, dance a waltz during a First Dance event hosted by Gulbrandson Orthotics & Prosthetics at the Holiday Inn in Crystal Lake on February 12, 2012. People with physical challenges were taught how to dance by instructors at the Center for Ballroom and Dance in Deer Park. Sarah Nader - snader@shawmedia.com Lauren Davis of Fox River Grove watch as the dance Instructors teach the group how to dance a waltz during Sunday's First Dance event hosted by Gulbrandson Orthotics & Prosthetics at the Holiday Inn in Crystal Lake on February 12, 2012. People with physical challenges were taught how to dance by instructors at the Center for Ballroom and Dance in Deer Park. Sarah Nader - snader@shawmedia.com Lauren Davis (right) of Fox River Grove dances a waltz with dance instructor Alisa Alyabyeva during Sunday's First Dance event hosted by Gulbrandson Orthotics & Prosthetics at the Holiday Inn in Crystal Lake on February 12, 2012. People with physical challenges were taught how to dance by instructors at the Center for Ballroom and Dance in Deer Park. 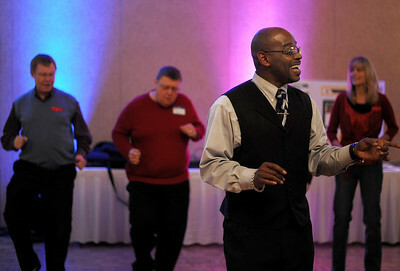 Sarah Nader - snader@shawmedia.com Dance instructors Cinnamon Trammell (center) shows the crowd merengue dance steps during Sunday's First Dance event hosted by Gulbrandson Orthotics & Prosthetics at the Holiday Inn in Crystal Lake on February 12, 2012. People with physical challenges were taught how to dance by instructors at the Center for Ballroom and Dance in Deer Park. Lauren Davis of Fox River Grove watch as the dance Instructors teach the group how to dance a waltz during Sunday's First Dance event hosted by Gulbrandson Orthotics & Prosthetics at the Holiday Inn in Crystal Lake on February 12, 2012. 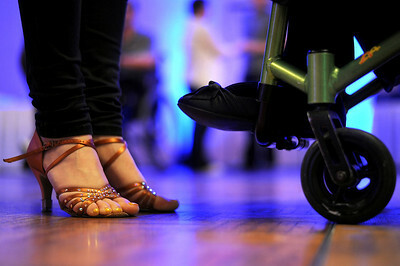 People with physical challenges were taught how to dance by instructors at the Center for Ballroom and Dance in Deer Park.